Case study for an employee wellbeing strategy. Humantech, an ergonomics consulting firm nurtures an employee wellbeing strategy by embracing a “palette of place”. Steelcase 360 Magazine editors published a great case study on wellbeing entitled “Taking the Lead” in Issue No. 70 entitled “Think Better”. The story encapsulates many of the issues that are ideally taken into account when redesigning space to boost employee wellbeing. According to the article, Humantech had seen their work change dramatically in just a few short years. Much like other companies, their business became more global and their employees were now highly mobile, but they were also seeing rapid technological and generational shifts that were changing expectations. In addition, they became more project-based with many teams distributed around the world. Their current real estate situation was not supporting these changes, to the detriment of their employee wellbeing. Dedicated offices were frequently empty and collaborative workspaces were virtually non-existent and frustrating to access. As the company re-imagined a new space that really supported their needs, they focused on how to transform it to provide employees with an environment that supported their physical, cognitive, and emotional wellbeing. Our company and the ways we worked had been transformed. Now it was time to transform our office. By embracing a “palette of place” in their redesign and giving employees choice and control in how and where they work, Humantech was able to execute a thoughtful employee wellbeing strategy. » Collaboration spaces, in various sizes, are located throughout the office and are easy to use – supporting democratic project team work. » There are spaces geared for focus (heads-down work), privacy, collaboration and socializing and employees are able to choose what space is right for their needs at any point in time. » Daylight floods the space and everyone has a view of the outdoors. » A variety of postures are available throughout the space, from sitting to perching and standing. The buoy has become a particular favorite! » A work cafe allows people to reconnect and informally gather as well as highlighting the company’s brand and culture. Supporting employee wellbeing is a bottom line issue in today’s competitive global economy. 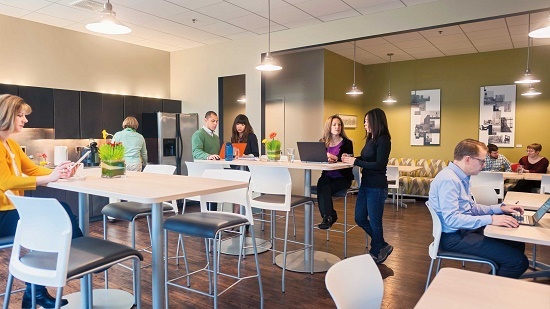 Creating strategic spaces that support the physical, cognitive and emotional needs of people not only can increase productivity but serve to attract, retain and engage top talent. Click here to learn more about Humantech and their new space. A brief tour of the Steelcase historical archives. 5 Questions for Red Thread's CEO, Jeff Keener.